It is appropriate for the Icelandic Emigration Center to be located in Hofsós, as the first white settler in America, Thorfinnur Karlsefni, came from the area near Hofsós. It is believed that Karlsefni may have set out to sea from this area when he sailed to America, eventually landing in Vinland (now Newfoundland). He and his wife Guðríður Thorbjarnardóttir established a home in Vinland between the years 1004 and 1006 during which time they had a son, Snorri Thorfinnsson, who was the first European to be born of immigrant parents in North America. After they returned to Iceland they settled at Glaumbær, nearby Hofsós. The village of Hofsós, one of the oldest trading centers in Iceland, was as much affected as the rest of the country by the “dire years” of the late 19th century. By the end of the 20th century the village had fallen into decline and was nearly desolate. As a result of years of neglect, the buildings in the old part of the village surrounding the river mouth and harbour, were on the verge of collapse. In 1990, Valgeir Thorvaldsson began work on restoring the old village center with the aim of preserving these treasures of traditional architecture and developing Hofsós into a cultural attraction. The first step towards reconstructing the village was taken when one of the oldest buildings in Iceland, the late 18th-century Hofsós Warehouse (Pakkhúsið), was restored and its former dignified look was returned. The building is owned by the National Museum of Iceland. Stage two in reclaiming the old village center was the reconstruction of the hotel which was built at the end of the 19th century. The refurbished hotel, now called Sólvík, houses a seasonal full-service restaurant overlooking the harbour. 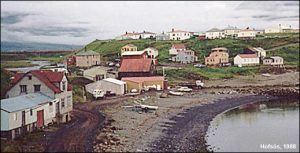 In addition, several of the houses in the harbour were renovated and sold privately. 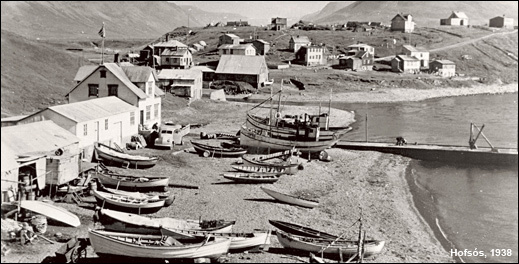 Valgeir Thorvaldsson has always been interested in the story of his ancestors who were among the 16,000 to 20,000 people who left Iceland between 1850 and 1914 to make a new life in North America. He had a dream of honouring all Icelandic emigrants from this time period by developing a center for information, service, and recreation for their descendants and other interested visitors. With this in mind, a plan to save The Old Co-op (Gamla Kaupfélagið) from ruin was initiated. A project on such a large scale, comprising the reconstruction of several of the old village buildings and the construction of new buildings, could not have been possible without active financial backing from private individuals, businesses, institutions, and public authorities. Under the leadership of Valgeir Thorvaldsson the company Snorri Thorfinnsson Ltd. was established in 1995. This company financed the early construction work and took on responsibility for the daily operation of the Center once it was opened. In 1996, the Old Co-op renovation was completed and the Glaumbær Museum was requested to develop an exhibit to be displayed inside the building. This exhibit, “New Land, New Life”, is on permanent loan from the Glaumbær Museum. The Old Co-op also encompasses “The Stephansson Study”, where visitors can view an exhibit about the life of the Icelandic-Canadian poet Stephan G. Stephansson. The building was officially opened in July 1996 by then President of Iceland, Vigdís Finnbogadóttir. In 1999, a government grant was recieved which made it possible to begin construction on a new building which would provide needed space for new exhibits and expansion of existing services. “Frændgarður” (The Family House), built in the style of the of the Old Warehouse, encompasses an exhibition hall, a genealogy center, a library, an administrative office, and an apartment for visiting scholars. When it was officially opened in the summer of 2000 by President of Iceland, Ólafur Ragnar Grímsson, Frændgarður displayed a new exhibition known as “The Road to Zion”. This exhibit, prepared in partnership with the Icelandic Association of Utah, tells the history of the approximately 400 Icelanders who emigrated to Utah, USA between 1852 and 1914. This attractive and popular exhibit moved to the Culture House in Reykjavik in 2004. At that time, a new exhibit of photography was opened in The Family House called “Silent Flashes”, designed by well-known historian and genealogist Nelson Gerrard. In the summer of 2002, the construction of “The King’s Retail Store” (Nýja Konungsverslunarhúsið) was completed and the building was opened by President of Iceland, Ólafur Ragnar Grímsson. Inside is an exhibit entitled “Prairies Wild and Free”, prepared in partnership with descendents of the Icelandic settlers of Pembina County, North Dakota. The building is a near-replica of a previous one as seen in early 19th century photographs of the Hofsos village center. In addition to the main floor exhibition, the building has an upper floor area dedicated as a multi-purpose hall where as many as 50 to 60 people can gather for meetings, seminars or social events. As of 2006, Snorri Thorfinnsson Ltd. has relinquished the operation of the organization. The Icelandic Emigration Center is now a non-profit society, under the direction of a new Board of Directors. The Board has assumed responsibility for the management of the buildings and operations and is engaged in making plans for the future of the Center. Several initiatives are underway, including the preparation of a new exhibit, the development of the genealogy service to better meet the requests received, and professional cataloguing of the Center library. In 2007, an agreement was reached with the Government of Iceland to provide substantial financial support to the Center for a five year period. This support provides a solid operational foundation from which the Center can plan for the future. 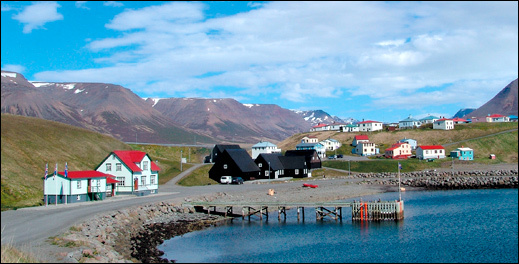 The Icelandic Emigration Center has been successful in facilitating closer bonds of friendship between Icelanders and people of Icelandic descent in North America. Through the Center, many people have established meaningful connections with others across the Atlantic. Interest has been rekindled among people in Iceland about a part of their history that has had a profound impact on the face of Iceland today. Many North Americans of Icelandic descent retain the strong sense of cultural identity that their forbears took with them to the New World more than a hundred years ago. The purpose of the Icelandic Emigration Center is to contribute to the consolidation of this contact and the preservation of the cultural heritage shared by the people of Iceland and North Americans of Icelandic descent.